Research Bulletins: How fast do DNA zip through nanopores? How fast do DNA zip through nanopores? The resistive pulse technique provides two basic observables from which to infer the properties of the translocating molecule. These are (a) the blockade time (b) the relative conductance change. The first of these is a measure of the speed (v) of the translocating molecule. The force driving the translocation is the electrical force acting on the part of the DNA inside the pore. This force is the voltage drop across the membrane times the charge on the polymer within the pore. For typical parameters, this amounts to about 20 pico Newton (pN). Since inertia plays no role at such small scales, to calculate the speed we need to set this driving force to equal a resistive force that will depend on the speed of translocation (v). What is the origin of this resistive force? I made the hypothesis that the resistive force arises primarily from the hydrodynamic drag on the part of the polymer that occupies the pore. The frictional drag from the polymer coil outside the pore as well as the "entropic force" required to straighten the polymer against thermal fluctuations are both small compared to this hydrodynamic drag from the pore. 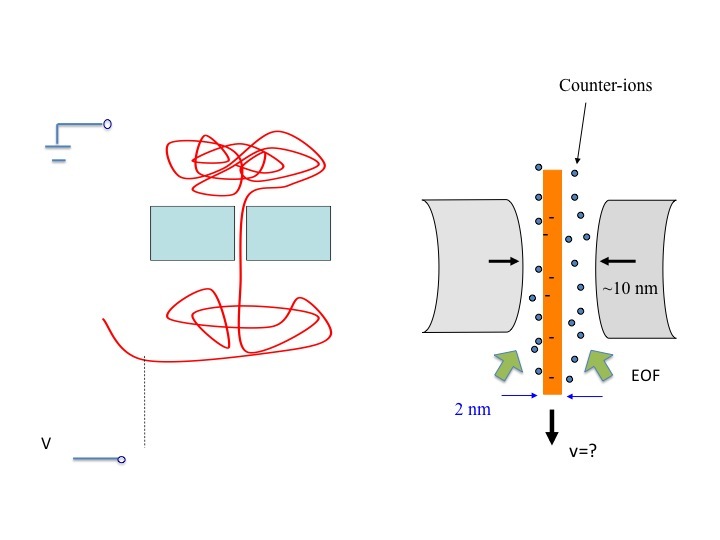 If the primary drag force arose from within the pore, the speed v would be independent of polymer length. This appears to hold to a good approximation from the experimental data. The hydrodynamic drag on a rod (the DNA) translating through a slightly larger pore (of arbitrary cylindrically symmetric shape) may be calculated using the classical "lubrication theory" of fluid mechanics. In our problem there is some additional physics not encountered in the classical problem and it is this: both the DNA and the wall of the capillary are charged and there is an applied electric field. As explained by Peter Debye all charged macromolecules carry a cloud of mobile counter-ions (positive ions or cations in the case of DNA) that "shield" their electrical interactions with other objects. The electric field acts on these counter-ions to create a body force that drives a jet of fluid upwards through the gap as the DNA moves downwards. This "electroosmotic" effect must be included in the calculation of the drag. Nevertheless, even with this additional effect the problem can be solved and an expression for the velocity obtained in closed form. The graph to the left shows how this formula measures up against the experimental data. The interesting thing about this graph is that it does not involved any "adjustable" parameters even though reasonable approximations (detailed in the papers cited below) need to be made. 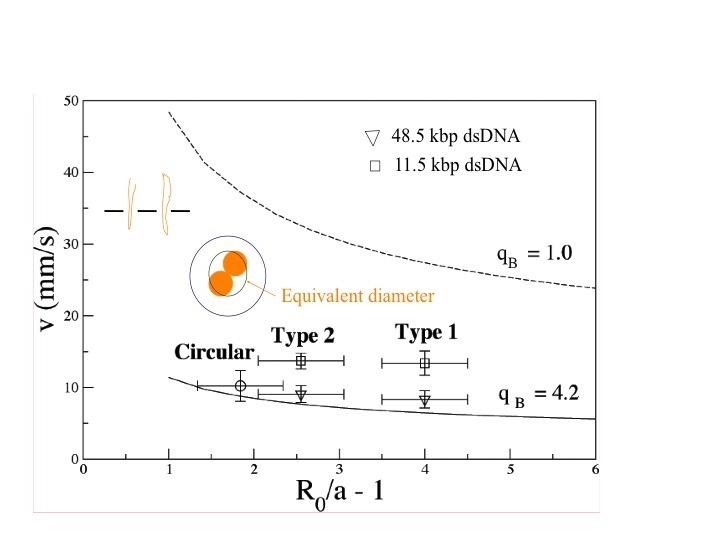 The upper dashed curve is calculated using the DNA bare charge and the lower curve uses the DNA "effective" charge in accordance with the Manning theory of counter-ion condensation. Catch a colloid by the tail ! My research is in the general area of mechanics and applied mathematics. I am particularly interested in fluid flow in small scale systems that have applications in the life sciences.